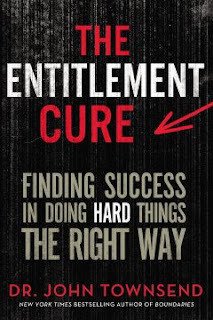 I thought the title of this book really drove home a point I'm passionate about: things are pretty darn easy these days, and we get lazy. You know what laziness translates into? Entitlement. Chances are we'll have an entire generation of entitled adults, if we don't already. Not I! So I was excited to review this book based on the title and subtitle. Unfortunately, it takes a pretty hard-edge view of things that was rather disparaging. It was not the hopeful, encouraging or even enlightening book I was expecting. I do not need to be barraged with the negativity. I want to know how we FIX this. How can I avoid it in my own life? How can we teach the next generation to dig in and do the hard work? This book was a disappointment for me. It might speak to some, but it didn't for me. Plus, I'm not sure anyone who actually IS entitled would pick up this book, giving it a "preach to the choir" angle that didn't suit me. Even the cover speaks of an axe to grind...and edge, instead of a hopeful point of view.